Orthodox Easter Day in Russia is not much different with other Christians in the other country. Even if there is a difference, it is not a matter of principle. Orthodox, Catholic, and Protestant Christians alike believe in the resurrection of Christ. The Easter celebrations in Russia are unlike anywhere else. Russians are more focused on the idea of ​​defeating death. Until now, Easter is still the main holiday of Christians in Russia. During the Easter Evening procession, people will come to church no mater that they may not understand their relationship with God. In some ways, Easter is the most egalitarian holiday in Russian Orthodoxy. Its because everyone can participate in the procession that takes place in the church, which is holding a burning candle. Regardless of who celebrates Easter and how to celebrate it, the Resurrection is a central event in the Gospel. However, Christians in each country celebrate in their own way. Read also What The Difference Christmas In Russia With Another Country. The main point of disagreement between Christians in the West and East is the calendar. The Russian Orthodox Church uses the Julius calendar, which was originally introduced by Julius Caesar in the first century BC. Meanwhile, Western churches adopted the Gregory calendar set by Pope Gregory XIII in the 16th century. There is a difference of 13 days between the two calendars (will be 14 days at 2100). In the 4th century, the priests agreed that Easter would be celebrated on the first Sunday after the appearance of the first full moon after the spring equinox that falls on 21 March. To calculate the first full moon after 21 March, the Orthodox use the Julius calendar. While the Catholics use Gregory’s calendar. in 2017, Easter fell on the same day. It was an opportunity to show brotherly love and everyone recalled the idea of Christian unity based on the same gospel. For the record, most Protestant Christians of Russia, except the Lutheran Church, calculate the date of Easter on the Julius calendar. It’s just like the Russian Orthodox Church. However, the American and Greek Orthodox Churches turned to a new style and celebrated Easter on the same day as Catholics. Orthodox Easter Day in Russia follows Julius’s calendar strictly as a transition to a new style will provoke anger among conservative congregations and provoke divisions. Easter is a very important and sacred feast for the Orthodox. After a long and fasting service during the week before Easter, the pastor, after leading a procession outside the church singing prayers and hymns. He stopped at a closed door at midnight. Then, he will open it. That is symbolically open the Holy Sepulcher and announce to the world that Christ has risen. During worship, the pastor and his congregation exchanged salutations – ‘Christ has risen!’ And ‘Verily he has risen!’. The whole ritual left a deep impression, and the joyful screams of the people echoed in the night sky. Renowned Russian poet Aleksandr Pushkin once wrote that he liked to go to church on Easter day because he could hear the voices of the Russians there. In the West, one of the most prominent Easter symbols is the Easter Bunny carrying eggs. Easter eggs in Russia will be accompanied by kulich, or Easter cake. Actually, Easter cake is quite popular throughout Europe. There are many recipes of Easter cakes from Italy that are also sold in Russia. One of Russia’s authentic culinary traditions is paskha (Russian for Easter). It is a dish made from cheese, raisins, and spices, and pyramid-shaped symbolizes the Tomb of Christ. As for the Easter game, Russia is just like many other European countries. For example, the Easter egg rolling competition has been a common tradition in Germany and Russia since the 19th century. It is now also an annual event in the United States held at the White House Southern Square. More recently, that tradition has risen again in Orthodox Easter Day in Russia. Many stores sell special sloping tracks that are used for rolling eggs. Each player will race to roll eggs to get the prize put on the finish line. Sometimes, ‘fights’ occur when someone throws another egg with its own egg to see who will break first. 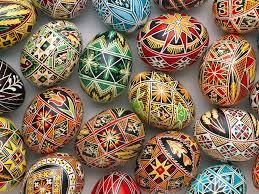 Housewives also compete to decorate their eggs as creatively and give them as gifts. The famous Fabergé egg made for the emperor is also given as a gift for his wife and mother. Surprisingly, there is a sad side to the Easter celebration in Russia. The tradition of visiting the cemetery to commemorate the dead relatives has survived since the Soviet era. People usually make pilgrimages to the graves of deceased family members, eat Easter eggs and kulich, and drink alcohol. Before the Soviet Union collapsed, the Russian Orthodox Church made no attempt to suppress this custom. The Soviet authorities allowed semipagan rituals were replacing religious holidays. In honor of one’s ancestors, as long as people did not go to church. The Church still can not stop this tradition. People still visit the cemetery on Easter day, and ignore the minister’s request to choose another day for pilgrimage. That’s all fact about Orthodox Easter Day in Russia. Many fact in Russia you should know. Read also How loving Vodka in Russia and Dining Etiquette in Russia.